This annual event is now well and truly our ‘Olympic Event’ as we aim to encourage, inspire and motivate children to take part in a range of new and different sports and activities whilst raising awareness of the Olympic and Paralympic values and our Spirit of the Games Values. 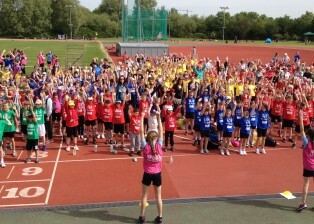 With 46 primary schools and a potential 1600+ children taking part this is our biggest event of the year. 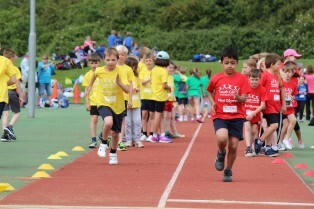 The event is delivered on the day by 120 sports leaders from across the Partnerships secondary schools. There are a wide range of Olympic and Paralympic themed activities for the children to have a go at; including shot putt, javelin, tug of war, hurdles, hockey, tennis, boccia, and long jump to name a few. There are opening and closing ceremonies led by the Partnerships Young Ambassadors with dance performances and a parade around the track by all of the children. A big thank you to all of our sponsors who are supporting this year’s event, in particular Total Promotions, who print and provide the Olympic coloured t-shirts for all of the children.